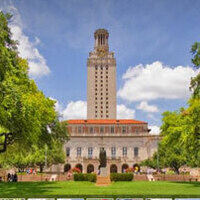 The Main Building (as referred to as "the Tower") is icon here at the University of Texas at Austin. The Tower is 307-feet tall and houses an observation deck at the top that offers a panoramic view of the UT Campus and the gorgeous city of Austin. Always a great day to meet up with other RAs around campus! Well organized and presented, good length of time, great snacks (though I always like more cookies, food, and fruit), excellent positive atmosphere. Letting nominated people know that they had been nominated and what was said about them was a wonderful idea. The raffle was fun and engaging and an offer of a travel award was also an excellent carrot for engagement. You all did a magnificent job. It was very touching and sad. I was, however, disappointed that with so many students on campus, there were so few of us there. I'm not sure why this was. Glad to see the National Parks getting out and making their presence more known. The free water was great discussion with the Redwood Forest enthusiast was quiet intriguing. Grabs a brochure and some sunglasses for my boys. Thanks!